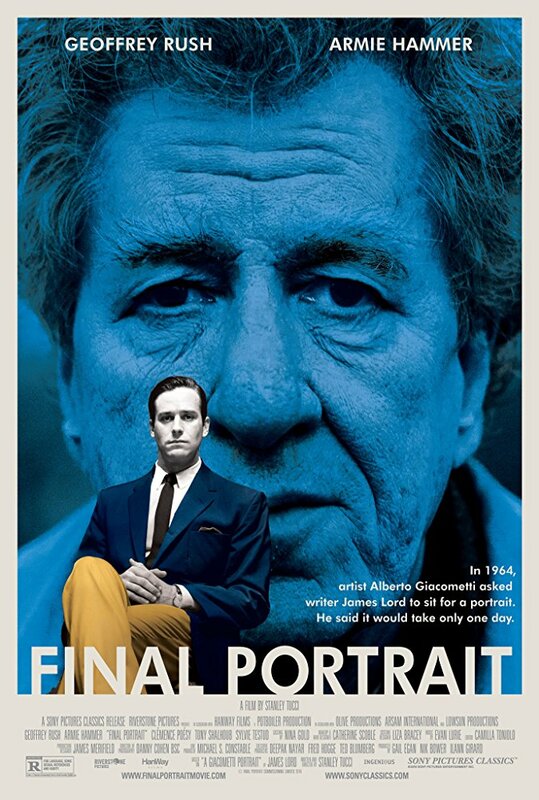 Final Portrait is one slice of the life of renowned artist Alberto Giacometti. It is a compelling look at the inner life of a man possessed a study not of his art but of the man himself that lingers long after we leave the theater. James Lord (Armie Hammer) is the American author who will write a book about the few days he spent with Giacometti (Geoffry Rush) at the end of his own trip to Paris. When he arrives at the painter’s studio, Lord announces he has a short time before his flight home to America and wanted to say goodbye. Giacometti announces that he wants to paint his friend’s portrait, an undertaking he promises will take only a few hours. The hours turn into two weeks for Lord who calls home frequently to report his delay. During the prolonged and frustrating work sessions, we absorb the details of Giacometti’s studio, his unfinished paintings, his personality, and the possible truth that everything about Giacometti is unfinished. Is that the cause of his deep frustration? The studio is in an unassuming, quite rundown part of the city, no fancy address for this famous man. As we are brought inside, we see a large room cluttered with the tools of his trade. Scattered on tables and counters, unfinished sculptures and paintings wait for his hand. Or are they finished? That’s the thought that comes to mind as we watch the painful passage of time as Giacometti paints his portrait of James Lord. He starts, covers his beginning with a light gray paint – it’s not right – and starts again. It’s the primary message of the film – Does this brilliant artist ever know exactly what he wants to produce and is he ever satisfied? As we follow Giacometti’s tortured process of creating a painting or a sculpture, we realize he is surrounded by unfinished work. Director Stanley Tucci wisely assumes that he can’t read the artist’s mind. He just shows us the unfinished result. As Giacometti paints, thinks, and erases repeatedly, we in the audience try to imagine what inner turmoil is causing all the changes. When that question falls short of any answer, we accept that this is what sets his work apart. His mental process is his alone. We have learned that his work springs from his mind to the canvas as if it were uninvited and suffers his own rejection nearly every time. Clemence Poesy plays Giacometti’s resident prostitute/lover. Tony Shalhoub is the artist’s brother, Diego. Armie Hammer is wisely restrained as the understanding friend, and Geoffrey Rush becomes the focus for everyone in the audience as well as in the movie. His Giacometti is astonishing in a state of silent frustration with his own work. He seems to be daring himself to fail by not knowing his own goal. Director Stanley Tucci gives us not a finished portrait of the famous artist, but a portrait of the chaotic mind and surroundings of a brilliant man. This review was posted on March 18, 2018, in Biography, Comedy, Drama. Bookmark the permalink.